Wait. Yes—I saw . . . something. Maybe? Something in the shaky camera work, in the grainy footage, between the hysteria and the tears, I am sure I saw something . . . didn’t I? Couple that with an incredibly clever (and, at the time, novel) marketing campaign, and The Blair Witch Project was far less of a “film” and more of a, well, project. Much like an alternate-reality game, the filmmakers infiltrated online message boards to drop hints about the movie’s lore, haunted various paranormal site forums, hung up missing-persons posters for the movie’s protagonists. By the time the film released, the line between what was real and what was fiction had been blurred. Pause a moment here: “Not for me!” you may exclaim. “It was so dumb and fake! I can’t believe anyone would actually believe that crap!” Good. Good for you. Good job. You are so smart and so brave, oh wow. I was the same way. But that doesn’t negate the fact that millions of viewers were able to suspend their disbelief. Before the days of viral everything, before Internet memes and constant contact, constant documentation, violating real spaces with fiction was done to an almost magical effect. For those able to experience The Blair Witch Project with the uncertainty of “fact,” it felt perverse. We were seeing something we weren’t supposed to see; we had stumbled onto something unclean, something maybe even dangerous. Whatever was in those woods was never supposed to leave them. It was that feeling, not the film itself, that made it so effective and made it so important to the horror genre. A flood of “found footage” films came in its wake, so many (and so many poorly done) that it killed whatever magic lived in there. Shaky cameras ended up being headache inducing, not atmospheric. And sobbing, snot-nosed close-ups called for eye-rolling annoyance, not sympathy. I was curious how the new film, simply titled Blair Witch, would touch audiences without the benefits of the first. There was no way to recreate the multimedia project of the original. The Blair Witch Project was, at its core, about breaking the mold. Director Adam Wingard clearly knew his limitations going in; this film was obviously designed for audiences with micro attention spans and no appreciation for slow-burn atmosphere. Blair Witch is filled to the brim with fast, jarring edits, in a bad way—nobody would edit a film of any sort in this way, except for someone attempting to craft a fast-paced movie that fit into a predetermined time slot. As an example, an “info dump” conversation at a club is full of quick, hard edits, changing from close-ups to distant shots to interesting angles. Nobody would edit a three-minute conversation in this way, especially not a group of amateur filmmakers. The first half of the film also spends an excessive amount of effort convincing us what normal, likable, easygoing, relatable young adults the protagonists are. It is the most bland and standard of all horror fare: you have to show mundane in order to contrast the horror. But there are ways to do this that aren’t painfully dull. We are never given enough info about the characters to care, and the motives behind each of them are flat and hollow. All of the cookie-cutter horror staples are present—romantic tension, the plucky skeptic, and the stoic believer. When the film made the issue of racial tension a presence in the film (aside from simply featuring black characters), I found it refreshing and self aware. But spoiler alert: guess which character is the first to die? When the scares do start to come, they feel expected in timing and content, again, relying far too heavily on the “Oooh, scary!—Wait, no, just kidding!—Oooh scary!” And when the film finally earns its horror label and moves full tilt, it’s entirely dependent on jump scares and gore, things that were almost entirely absent from the first. I don’t have anything against jump scares; I think that, used well, they can be incredibly effective. My issue is when they become the main event. Any feelings of unease stop when they do. It’s like leaving a haunted house at an amusement park. Everything scary is left inside. Ambiance and atmosphere, on the other hand, linger. I was left with a lot of logistical questions that I found very immersion breaking. The question of “Who is filming?” was a constant issue—the explanation of tech was very short and sloppy—and felt very frustrating, when it could have been handled in a way that enhanced the story, such as in the film REC. And a character ends up with a serious injury to a limb and yet is able to hike all day and climb trees. All criticism considered, the ending sequence of the film was genuinely creepy, and I do not say that lightly. I liked it enough that it almost made everything else worth slogging through. And there were some clever tricks employed that were certainly commendable. Wingard draws on some common phobias here and forces them onto the audience unapologetically. One of the interesting elements of The Blair Witch Project was that nothing was ever confirmed as supernatural. 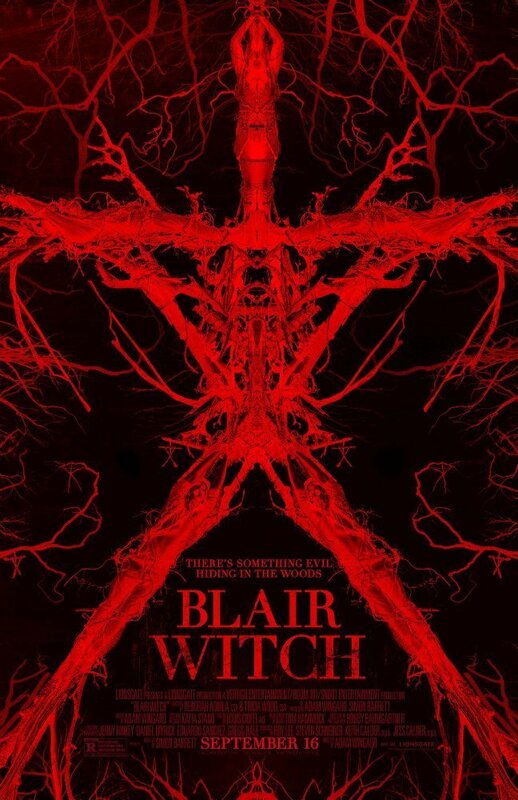 That’s thrown to the wind in the new film, where we see not only all manner of spooky but also the Blair Witch herself. I am a firm believer in the idea that the best way to ruin a horror film is to show the monster. But here, it worked. By the time the credits rolled, I realized I had been smiling for the past 20 minutes. And when I overheard someone say, as the audience filed out, “Did you see that?! Did you? What the [bleep] was that? !” I knew that while it was impossible to replicate the experience of the original, it never tried. It didn’t have to. 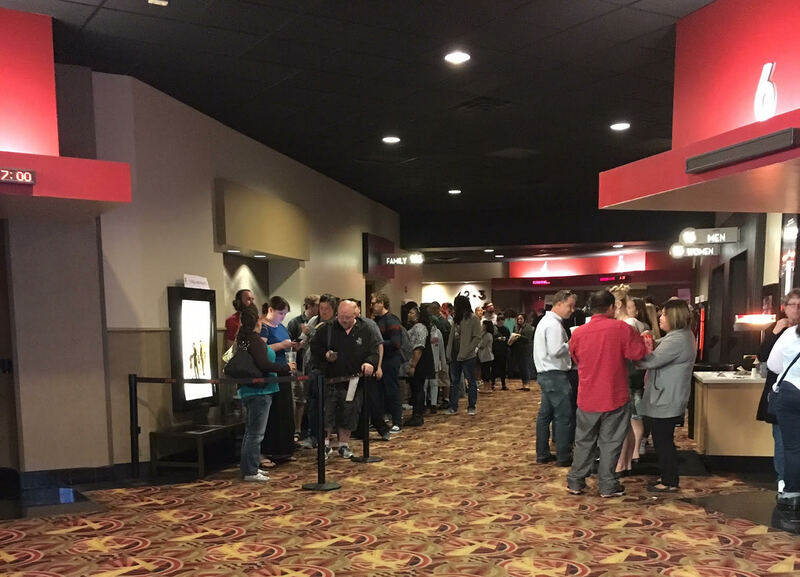 The crowd waiting to get into the advance screening of Blair Witch at Rosedale on September 14.